I’m set up to skip watering if it rains more then 0.0625 inches. My weather station recorded 0.333 inches of rain yesterday. Today the watering schedule ran. Is there another setting that overrides the cancellation of watering In this case? I would have thought the watering would have been cancelled for today because of the amount of rain yesterday. Or am I missing the concept? But, if running flex daily…if your moisture level ends up at zero, even with the recorded rainfall, it will still run. Post up your moisture details and lets take a look. Also, why are you setting the rain skip so low? Thanks for the response. I’m running flex daily. I’m running the skip so low because we’ve had so much moisture here in SoCal I didn’t want to over water. My moisture was at 0%, but I would have thought that having 0.333 inches of rain that it would still cause the watering schedule to be skipped. I’m disappointed. Does that mean I have to look at the moisture level every day regardless of the weather? That’s very disappointing? Am I missing something here? So does that mean moister level has nothing to do with weather? It only gets filled or emptied based on watering scheduled? If the PWS you selected is working correctly, with Flex Daily, rain will add to soil moisture. Plants use and transpire moisture. Plants can use more moisture in a day than it has rained, so net moisture balance is negative. If it rains more than plants can use, then your soil moisture balance increases and may delay watering for another day until you get near 0% moisture balance. That is how Flex Daily “skips” and when setup adequately, you shouldn’t feel the need to monitor moisture. Rain Skip only works with Fixed schedules. Take a look at your Soil Moisture chart to get a better sense of what is happening. Screen capture the moisture table (chart too if you like) and post it here if you’d like some help interpreting it. I don’t understand why the moisture balance (top row) shows zero on 3/20 when on 3/19 the “previous balance” was 0.16” and hardly any evapotranspiration. It should have shown a balance of 0.09” on 3/21, the same value as shown at the bottom of the table on 3/20. Did you accidentally hit the Empty button on the soil moisture screen? But the good news is, besides that descreprency, it looks like Rachio is working as intended! Note 3rd row from the bottom, on 3/21 the table shows 0.14. 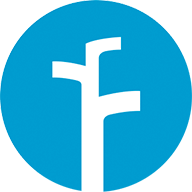 Rachio is expecting around 0.14 inches of precipitation today. Rachio also shows 0.29” of irrigation today. Rachio expects 0.05” of evapotranspiration, leaving a balance of 0.33” and 110% soil moisture balance. You’ll see that the 0.33” is carried forward to 3/22, top row. The next day, 3/22, Rachio knows not to water because the soil has plenty of moisture at 87% moisture balance. And there’s plenty of modeled soil moisture for the next day on 3/23. So it is in essence “skipping” days of watering because with current settings, Rachio believes the soil and plants in that zone have plenty of water. 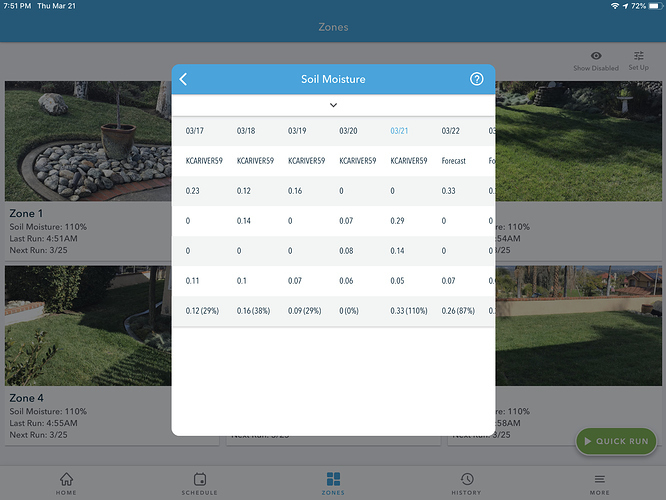 This is not Rain Skip in action because in this case Rachio is tracking soil moisture balance and smartly determining when to or when not to water. Thank you for the explanation. I obviously still have things to learn.